Violent protests in the cradle of Arab Spring have flared up as tens of thousands of youths battle with police in Tunisia during the funeral procession for secular opposition leader Chokri Belaid and Egyptians fire-bomb the presidential palace. Tunisian police fired teargas at demonstrators who threw stones and set cars ablaze and stole from mourners as at least 50,000 people turned out to honour Belaid in his home district of Jebel al-Jaloud in the capital. In Egypt, at least 45 people were hurt during the day across the country with some of the most violent clashes today in the Nile Delta town of Tanta, hometown of an activist, 23-year-old Mohamed el-Gendi, who was buried there this week after being beaten to death by security men in Cairo. 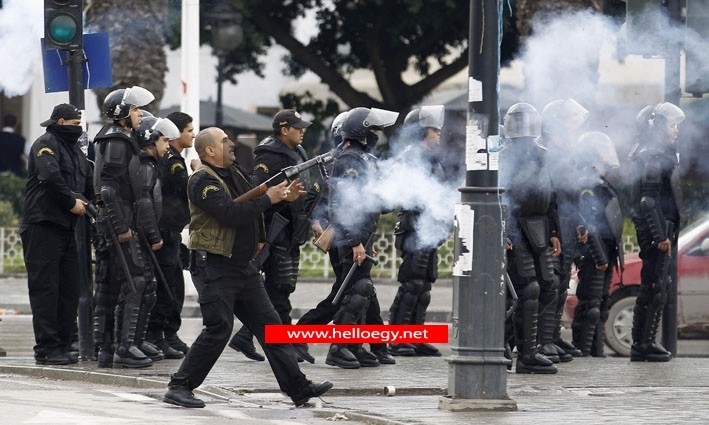 Protesters also attacked the presidential palace, throwing homemade bombs and stones. Two years after autocratic rulers have been swept from power, many in Egypt and Tunisia are angry over what they see as an attempt by Islamists to hijack their revolutions without improving their prospects for a better life. Lawyer Shokri Belaid, who died in hospital after being shot four times outside his home in Tunis, was a leading member of the Popular Front party and a constant critic of the government. Witnesses said that some of the youths, armed with clubs and machetes, were just opportunistic hooligans and were not involved in the funeral procession. Belaid's death has exacerbated Tunisia's political crisis and escalated tensions in the North African nation that helped kick off the Arab Spring. His funeral procession passed into the cemetery amid a scene of chaos caught live on television. Gangs of young men threw rocks at police trying to stop them from destroying cars in a nearby municipal lot, and police responded with tear gas. 'These kids are uncontrollable and don't follow any political ideology,' said Moncef Chebbi, 68, a retired computer programmer attending the funeral. Witnesses described the young men in tracksuits - many armed with clubs and machetes - as hooligans seeking to take advantage of the turmoil surrounding the funeral. 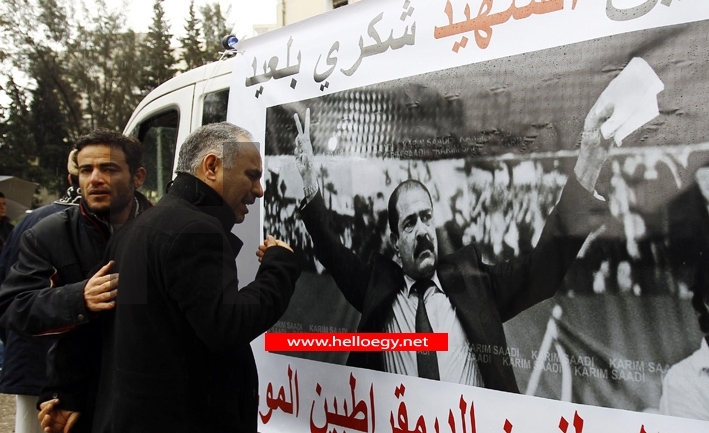 There were demonstrations and symbolic funerals held for Belaid in several cities around the country. 'The people want a new revolution,' shouted mourners in Tunis, who also sang the national anthem. It was Tunisia's biggest funeral since the death of Habib Bourguiba, independence leader and first president, in 2000. Crowds surged around an open army truck carrying Belaid's coffin, draped in a red and white Tunisian flag, from a cultural centre in Jebel al-Jaloud towards the leafy Jallaz cemetery, as a security forces helicopter flew overhead. 'Belaid, rest in peace, we will continue the struggle,' mourners chanted, holding portraits of the politician killed near his home on Wednesday by a gunman who fled on a motorcycle. Some demonstrators denounced Rachid Ghannouchi, leader of the ruling Islamist Ennahda party. Crowds in the southern mining town of Gafsa, a stronghold of support for Belaid, chanted 'The people want the fall of the regime', a slogan first used against Ben Ali. In Sidi Bouzid, the southern town where the revolt against the ousted strongman began, about 10,000 marched to mourn Belaid and shout slogans against Ennahda and the government. Banks, factories and some shops were closed in Tunis and other cities in response to a strike called by unions in protest at Belaid's killing, but buses were running normally. Tunis Air suspended all its flights because of the strikes, a spokesman for the national airline said. Airport sources in Cairo said EgyptAir had cancelled two flights to Tunisia after staff at Tunis airport joined the general strike. After Belaid's assassination, Prime Minister Hamdi Jebali, an Islamist, said he would dissolve the government and form a cabinet of technocrats to rule until elections could be held. But his own Ennahda party and its secular coalition partners complained they had not been consulted, casting doubt over the status of the government and compounding political uncertainty. 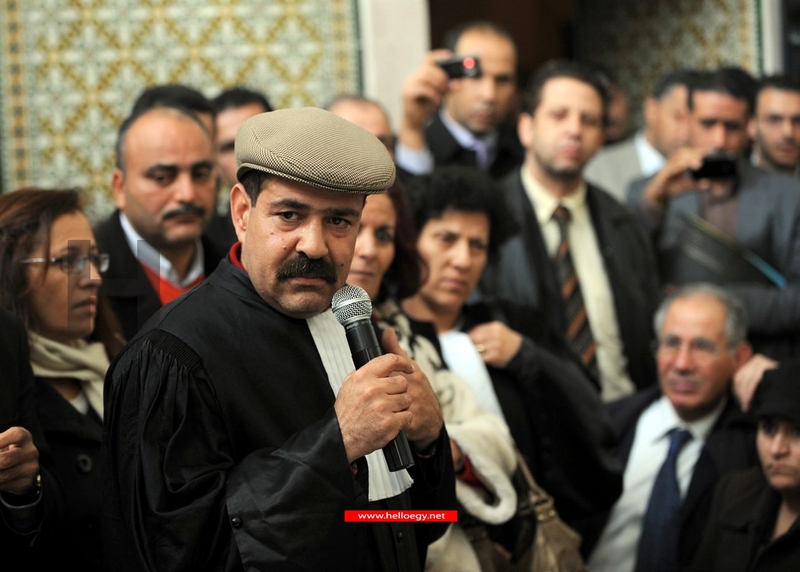 No one has claimed responsibility for the killing of Belaid, a lawyer and secular opposition figure. His family have blamed Ennahda but the party has denied any hand in the shooting. Crowds have attacked several Ennahda party offices in Tunis and other cities in the past two days. 'Hope still exists in Tunisia,' Fatma Saidan, a noted Tunisian actor, told Reuters at Belaid's funeral. Secular groups have accused the Islamist-led government of a lax response to attacks by ultra-orthodox Salafi Islamists on cinemas, theatres and bars in recent months. The economic effect of political uncertainty and street unrest could be serious in a country which has yet to draft a new constitution and which relies heavily on the tourist trade. Mohamed Ali Toumi, president of the Tunisian Federation of Travel Agencies, described the week's events as a catastrophe that would have a negative impact on tourism, but he told the national news agency TAP no cancellations had been reported yet. France, which had already announced the closure of its schools in Tunis on Friday and Saturday, urged its nationals to stay clear of potential flashpoints in the capital. In Egypt today, people marched and chanted against Islamist President Mohamed Mursi in cities across the country and a few hundred attacked the presidential palace with petrol bombs and rocks. At least 45 people were hurt during the day across the country, medical sources at the health ministry said. Two officers and three soldiers of the Republic Guard were wounded in clashes, the state news agency MENA reported. Protests erupted last month over what demonstrators saw as Mursi's attempts to monopolise power as well as wider political and economic grievances. The main opposition alliance signed an agreement with the ruling Muslim Brotherhood last week rejecting violence and had not officially called for marches today, although some of the alliance's younger members called for protests. While the number of protesters has dwindled, distrust of Mursi and the Brotherhood and a sense of political and economic malaise have continued to bring people into the streets. At least 59 people were killed in the demonstrations between January 25 - the second anniversary of the uprising that toppled President Hosni Mubarak – and February 4. A few hundred protesters gathered outside the presidential palace in Cairo as night fell, throwing stones and homemade bombs at the main gate. Police fired into the air, shot teargas and drove cars toward the crowd to scatter them. ‘The people want to overthrow the regime,’ the protesters chanted, turning the slogan of Arab Spring protests against the Islamist-led government they helped bring to power. In Zagazig north of Cairo, protesters gathered in the area of Mursi's home, MENA said. The demonstrators threw rocks at police, who fired teargas back. Television footage showed scores of protesters in Zagazig lobbing petrol bombs at riot police, who responded with teargas to scatter the demonstrators. ‘Down, down with the rule of the Supreme Guide,’ protesters chanted, referring to Mohamed Badie, leader of the Brotherhood, which has dominated Egypt's politics since the fall of Mubarak. In al-Mahalla al-Kubra, another delta town, protesters threw bombs and broke down the door of a city council building as they tried to break in, MENA reported. Police fired teargas to disperse them. The Brotherhood's Freedom and Justice Party issued a statement on its Facebook page condemning ‘the attempts of some political forces in al-Mahalla al-Kubra to incite violence and destruction of public property’. In Kafr el-Sheikh, dozens of protesters pelted police with rocks and tried to storm a government building to demand the removal of the provincial governor, MENA said. At a subway station near Tahrir Square, epicentre of the 18-day revolt that toppled Mubarak, demonstrators stopped trains by climbing onto the tracks, MENA reported.